Born Stockport, 19th March 1983. Son of Nicky, grandson of Guy, Adam is the latest of the Allott dynasty to ride for Sheffield. Following his excellent results for the Owlerton Prowlers Adam was given his home debut as a stand-in for the injured Peter Boast on the 27th May against Exeter. A brilliant first ride saw him follow Simon Cartwright home for a 5-1, but engine problems meant no further points that night. Adam's outings with Buxton see him continue to develop and highlights include the Bronze helmet won from Andrew Appleton of Newport, and victory in the Hull 700 Individual event. Adam finished the 1999 season in style with an impressive display at Newport in the Young Shield final. Born Louth, Lincolnshire, 11th April 1964. A schoolboy moto-crosser, Peter spent 12 years road-racing with major trophy successes in both the Isle of Man and Ulster. 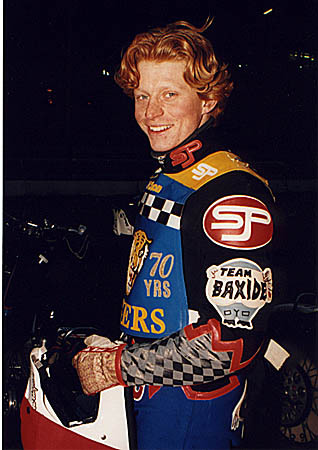 Spent 1993 flat-racing in America before a belated start on the shale in Sheffield second halves. 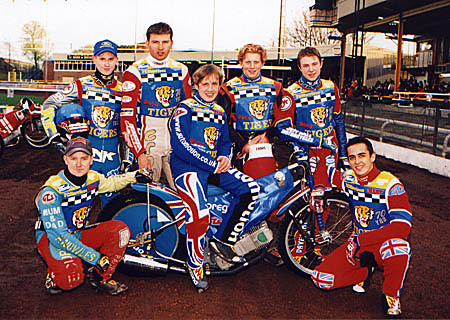 Joined the Tigers for the first half of '97 before rejoning Conference League Mildenhall Fen Tigers, ultimately as their captain and star rider. Continues to act as instructor at Cadwell Park, Donnington and Brands Hatch and doubles up for Kings Lynn in the Conference League this year. Peter won the 'Stars of Tomorrow' individual at Saddlebow Road on the 12th May with a 5 ride maximum, and followed it up with his first Premier League paid maximum against Berwick the following night. Peter's season ended in his first race against the Isle of Wight on the 20th May when he careered into the fence and sustained wrist injuries. Born Northallerton, North Yorkshire, 2nd November 1978. 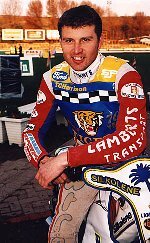 Son of former Halifax favourite Ian Cartwright, Simon rode for the Hull Vikings in his first year at Premier League level in '98 finishing the campaign with a creditable 3.25 average. His form for the Tigers steadily improves including victories over Jesper Olsen and from the back over David Walsh in the home match against Newcastle in June. 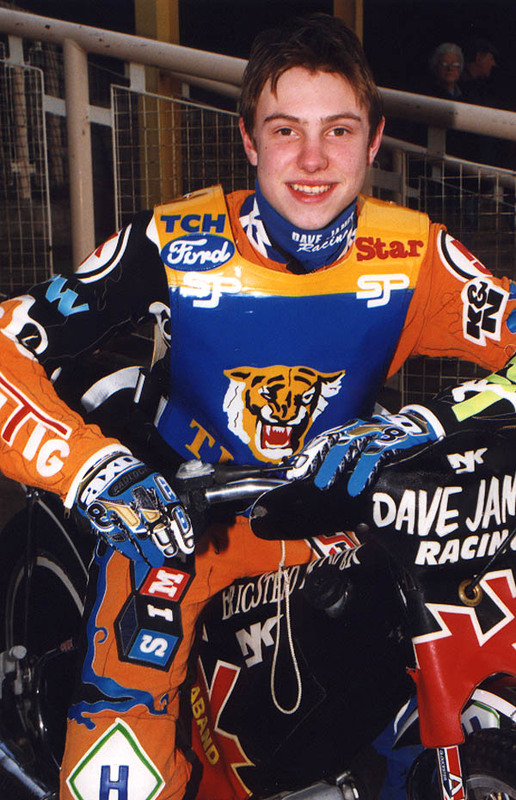 His 7+3 on his debut at Glasgow's Ashfield track was instrumental in the Tigers glorious victory in Scotland. 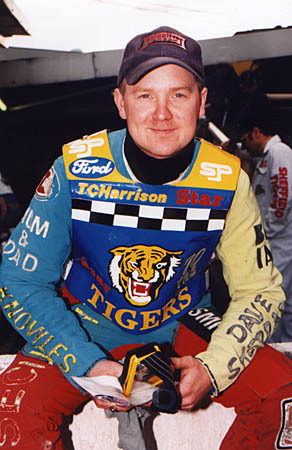 Former Bradford junior who rode for Newcastle in 1997 and joined the Tigers on loan from Bradford in 1998. 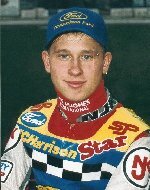 André qualified for the World Under 21 Final in 1998, but the highlight of the season must have been his debut maximum against Arena Essex when he completed his 15 points by passing Leigh Lanham in the nominated riders heat. André has Nik Thorp as his full-time mechanic this year, looking after his Klaus Lausch tuned engines as he chases a 10 point average. He has already secured several open meeting invitations (3rd in the Newcastle 70th Anniversary meeting) and numerous guest bookings, including a guest booking at Elite League Peterborough which saw him inflict a rare home defeat on Jason Crump! Following the closure of Long Eaton prior to the '98 season Paul spent last year riding for the Hull Vikings at New Craven Park, but failed to make the improvement his previous form had suggested. Paul turned down the opportunity of riding at his new parent track Workington and despite overtures from Stoke, Wolverhampton and Ipswich elected to join the Tigers at his favourite track. Secured several guest bookings for Elite League side Kings Lynn following the retirement of Darren Grayling in which he aquitted himself admirably. Paul's best meeting at Owlerton was a glorious match winning 13+1 in the Young Shield semi-final first leg against Swindon, when the chips were down. Andrew impressed Louis Carr at a pre-season trial and was quickly offered a team place with the Prowlers. He made his senior debut as a replacement for Peter Boast at Brough Park where his 3 points were vital in the Tigers 2 point victory. 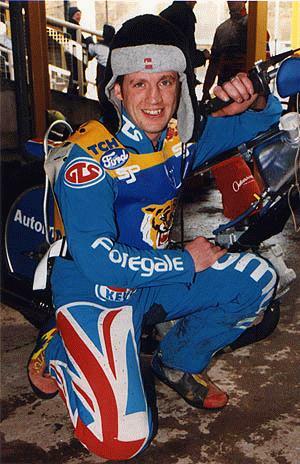 Days later Andy was badly injured at Newport while riding for Mildenhall in the Conference League. Scott struggled at times last season which saw his average drop to 7.18 but having been given another chance he is determined to reverse the trend. Even when left at the start Scott never gives in and last to first dashes are commonplace. Scott's nickname comes from the (unguided) "Scud" missile. 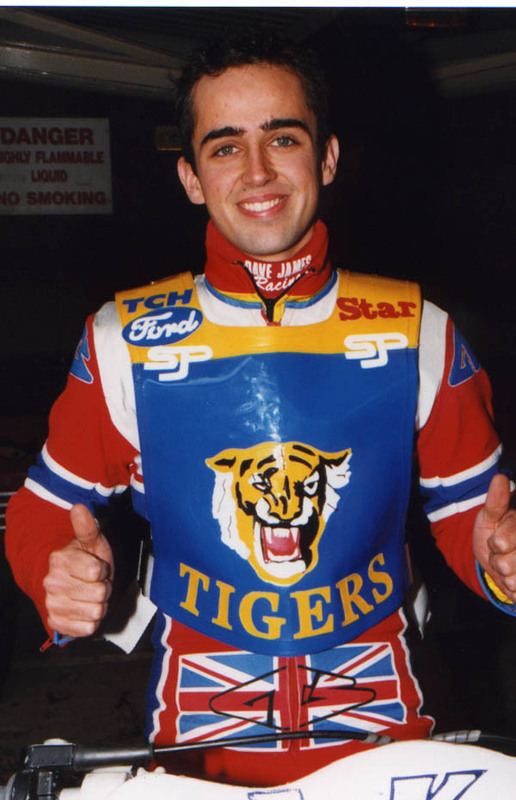 The highlight of Scud's season was when he top scored for the Tigers in their brilliant win in the 4's Final at Peterborough, and the downside was having to spectate as the Tigers ripped apart Newport in the Young Shield Final first leg whilst suffering concussion following a heat 13 crash with Phillipe Berge on the Isle of Wight. Born Sheffield, 25th April 1982. Another local lad, Simon cut his teeth on the Sheffield training track before opting to spend his first senior season racing for the Peterborough Panthers which he finished with a 5.35 average. With the Panthers rejoining the Elite League for '99 Simon is delighted to join his home team club where he can measure his development against fellow youngsters Paul Lee and Simon Cartwright. Raced to his debut maximum for the Tigers with 13 paid 15 against the Berwick Bandits in May. Picked up a broken bone in his foot in a nasty fall at Owlerton against Swindon in the Young Shield semi-final, but bounced back in time to help rout the Wasps in the final. Born York, 7th November 1969. Sean returns to the club he made his senior debut with back in the 80's. 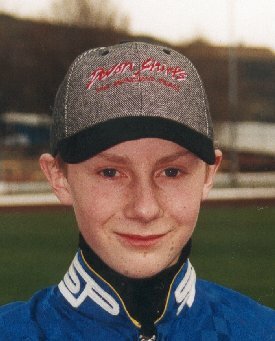 Following Owlerton's closure he then rode for a number of different teams including most recently Bradford, Swindon and Belle Vue at Elite League level. Sean is certain to become one of the stars of the Premier League and has certainly not forgotten the quickest route around Owlerton. Maximums at Swindon and Stoke and at home against Swindon and Workington came to an end when he suffered an engine failure against Stoke, but Sean is equally valuable off track doing a brilliant Captain's job in the pits and is extremely popular with the fans. Sean's season was topped with a brilliant from the back win in the Premier League Riders Championship. Despite suffering a nasty foot injury from a broken chain at Workington Sean rode at Swindon after pain killing injections to ensure qualification to the Young Shield final. A brilliant home maximum in the final set up the Tigers for the 2nd leg where they won despite Sean suffering from first a clutch failure, and then the big-end going. beat Leigh Lanham(ef) at Arena Essex, 4th June. beat Derrol Keats(f) at Sheffield, 10th June. beat Phil Morris at Reading, 21st June. beat Phil Morris at Sheffield, 24th June. beat Danny Bird at Sheffield, 1st July. lost to Carl Stonehewer at Workington, 3rd July.